Mythical and never typical, the mermaid lives under the sea and charms all she meets with her fantastic features. With the head and upper body of a classic human beauty and the lower body shimmering with the scales and tail flipper of a fish. Mermaids are truly the essence of sea legend and donning a mermaid costume gives you the chance to create your own. Are you lured in by the sweet siren song of a mermaid costume? Whether you aspire to be mermaid, merman, or mer-child, there are oceans of water-inspired costumes to fit all ages and sizes A mermaid bunting for the littlest underwater goddess is just as cute as it is snuggly. Toddlers and older girls will squeal in delight at the chance to dress up in one of Disney’s licensed Ariel costumes. Ariel costume accessories run the aquatic array from signature red wig to slip on heels and even decorations for the perfect party. Grown up mermaids can top off the water diva look with a long flowing wig and iridescent, glittering make-up. 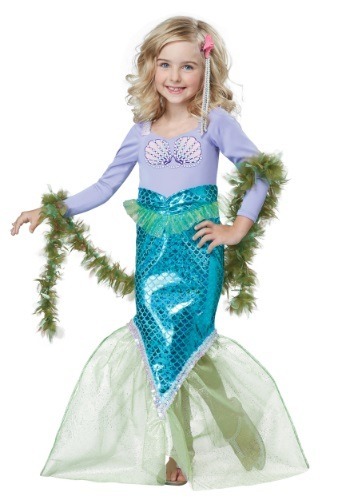 Get your Little Mermaid costume today.